Swansea eased into the LDV Vans Trophy southern area quarter-finals at the expense of Rushden and Diamonds. Despite making nine changes the home side bossed the game, with Andy Robinson heading in Marc Goodfellow's cross to give Swansea the lead. Robinson struck again after the break, thumping home after Goodfellow and Shaun MacDonald worked a short corner. 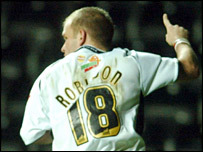 Gary Monk headed in his first ever goal for Swansea, with Paul Connor rounding things off with a low left-footed shot. Swansea: Murphy, Fisken, O'Leary (Tudur-Jones 77), Monk, Austin, MacDonald, Martinez, Robinson (Bond 82), Connor, Forbes, Goodfellow. Subs Not Used: Pritchard, Britton, Gueret. Goals: Robinson 20, 65, Monk 76, Connor 89. Rushden & D'monds: Ruddy, Gier, Gulliver, Dempster, Hawkins, Burgess, McCafferty, Mills, Kelly, O'Grady (Taylor 72), Armstrong (Tomlin 68). Subs Not Used: Young, Savage, Kennedy. Ref: A Marriner (W Midlands).